Japan’s 10Y yield spiked in tandem with its peers globally, is it tolerable for the BoJ? FX investors have been quite subdued during Asian hours trading as most of them seem to impatiently awaiting the jobs report from the US. Taking into account the latest amazing rally in US yields it appears that risks seem to be tilted to the downside for the US dollar. This is especially true when we go back to the most recent NFP release showing a healthy increase in wage growth. We have had a brush with similar developments earlier this year but then sudden spikes in wages turned out to be one-off event rather than an onset of a new trend. Even as growth stays pretty unchanged it seems that there is no too much space for yield to grow from the current levels. During benign trading in Asia the US dollar and other currencies alike have been barely changed, and the former is trading subtly higher this morning. In terms of macroeconomic releases we were offered over the past hours one needs to mention data from Japan. First of all, overall household spending for August jumped 2.8% YoY smashing the median estimate of 0.1%. In turn, wage growth for September came below expectations bringing a 0.9% rise and a 0.6% decrease when it comes to nominal and real earnings respectively (both releases in annual terms and both far below their previous values as well). Could household expenditure be sustained? There are some doubts. Even as spending in August was surprisingly high given the poor weather in that month, this data has tended to deliver one-off spikes and then going back to its underlying (weak) trend. Therefore we think it is too early to draw any far-reaching consequences in this field. Instead we prefer to wait for another month to confirm or deny our assumption. 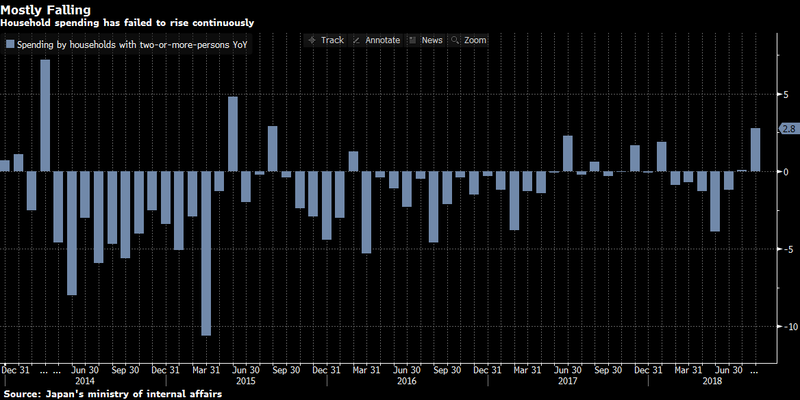 In this respect one cannot forget that consumers have been recently affected by rising oil prices as well as the declining yen - both factors may curtail consumers’ purchasing power and thereby bring a reversal of August’ spike in spending. The Japanese currency has been obviously unchanged disregarding any data from the domestic economy. Let us also remind that we saw a rise in yield globally on Thursday and the Japanese bond market saw a sell-off alike with the 10Y yield rising to above 0.16%. Is this a problem for the Bank of Japan? The answer seems to be “no” as the BoJ said it was following through on its pledge in July to allow bond yields to move more flexibly. As a consequence, it did not intervene in the market yesterday. The second topic we are bringing up in the morning post concerns Italy as the country came up with new GDP forecasts. 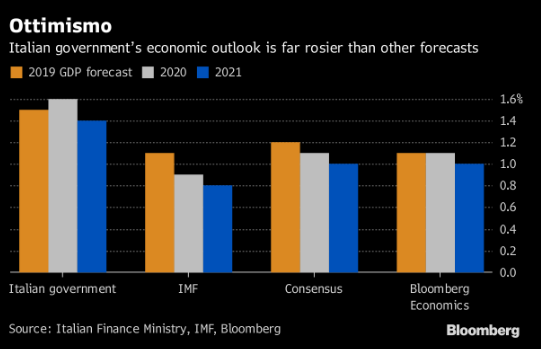 Recall that the Italian government presented initial deficit targets last week and then it decided to cut projections for 2020 and 2021. Yesterday we were offered fresh economic growth forecasts showing that GDP should grow 1.5%, 1.6% and 1.4% in 2019, 2020 and 2021 respectively. Are these forecasts feasible? Based on projections collected by Bloomberg it looks that the government projections look too optimistic. They are also higher than those prepared by the IMF. As a result, the Italian woes may once again dent the euro to some extent as bond prices could drive lower at the opening. Notice that the Italian 10Y yield moved lower toward 3.20% after topping above 3.45% on 2 October.